The authentication procedure involves verifying and certifying the authenticity and the legality of an education document and its contents. This procedure is only applicable in relation to those states which require, on the basis of reciprocity, either the Hague Apostille or superlegalization. We recommend that you contact the competent authorities of the destination country involved in the recognition of education. These institutions contact details may be found on the ENIC-NARIC websites maintained by the network of National Centres for the Recognition and Equivalence of Diplomas. The authentication of diplomas pertaining to the pre-university education system is performed by the respective County School Inspectorates / Bucharest School Inspectorate. The applicants may submit their documents with any higher education state institution in Romania or with the National Centre for the Recognition an Equivalence of Diplomas. If the power of attorney was issued in another state, will be submitted a certified copy for Romanian, English, French, Spanish and Italian language or certified copy and translation for other languages. The power of attorney must be endorsed with an apostille or legalized by the competent authorities of the country in whose territory has been issued, except those made in countries that have signed with Romania conventions, treaties or agreements on legal assistance in civil matters, which provide exemption from any legalization, respectively: Albania, Austria, Bosnia and Herzegovina, Bulgaria, Croatia, the Russian Federation, the former Yugoslav Republic of Macedonia, France, Mongolia, Montenegro, Poland, R. P. China, Moldova, Serbia, Slovakia, Slovenia, Ukraine, Hungary. CNRED shall accept documents of power of attorney issued by the Embassies or Consular Offices of Romania in various states. Such documents witnessed by the ambassador or the consul shall not require translation, legalisation or the Apostille. The applicant must verify that all relevant documents have been signed by the University chancellor and bear the official seal of the issuing University. For the authentication of graduation diplomas, bachelor’s degree diplomas, master’s degree diplomas or post-university studies diplomas, the folder must include a simple photocopy of the transcript of records / Diploma Supplement. For the authentication of the certificate of qualifications for teaching staff, level I, the application must include a simple photocopy of the front and back of the bachelors degree diploma, if it was previously authenticated. If not, it must include a copy of the front and back of the bachelor’s degree diploma and a copy of the front and back of the transcript of records / Diploma Supplement. For the authentication of the certificate of qualifications for teaching staff, level II, the application must include a simple photocopy of the front and back of the master’s degree diploma, if already authenticated. If not, it must include a copy of the front and back of the master’s degree diploma and a copy of the front and back of the transcript of records / Diploma Supplement. For the authentication of the certificate attesting the enrolment, the scholar achievements or the completion of studies for foreign citizens, the certificate shall include the number of the document issued by the Ministry of National Education which allowed them access to enrolment (Letter of acceptance, Order of the Minister or Recognition Certificate, as applicable); should that not be possible, the applicant must bring a photocopy of the document issued by the Ministry of National Education which allowed them access to enrolment. For the authentication of the master’s degree diploma, the post-university studies diploma or the certificate of completion of studies at master’s degree level, the application must include a simple front-and-back photocopy of the bachelor’s degree diploma which allowed the applicant to enrol for those studies, if it was previously authenticated. If not, it must include a front-and-back photocopy of the bachelor’s degree diploma and a copy of the front and back of the transcript of records / Diploma Supplement. For the authentication of the transcript of records/Diploma Supplement, the application must include a simple front-and-back photocopy of the diploma, if it was previously authenticated. If not, it must be included for authentication. For the authentication of the analytical curricula, the application must include a simple front-and-back photocopy of the diploma and the transcript of records/Diploma Supplement if these were previously authenticated. If not, they must be included for authentication. Acceptance and processing of the applications: Monday - Thursday, 09:00 - 11:00 and 13:00 - 14:00. 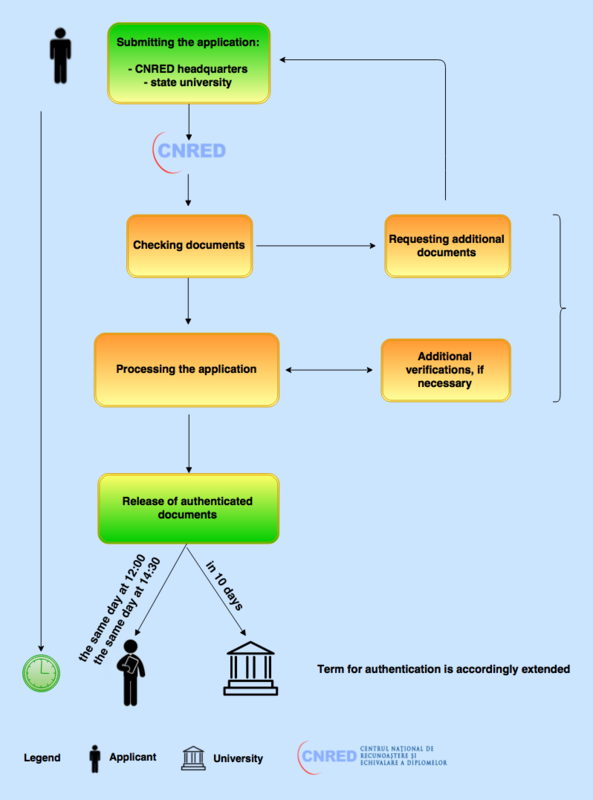 Issuing of authenticated documents: same day, at 12:00 and at 14:30, for the applications submitted directly to CNRED. The applications submitted with state universities are returned in approximately 10 working days. The procedure for Authentication of documents issued by higher education institutions can be consulted in Point of Single Contact and Electronic Procedures.